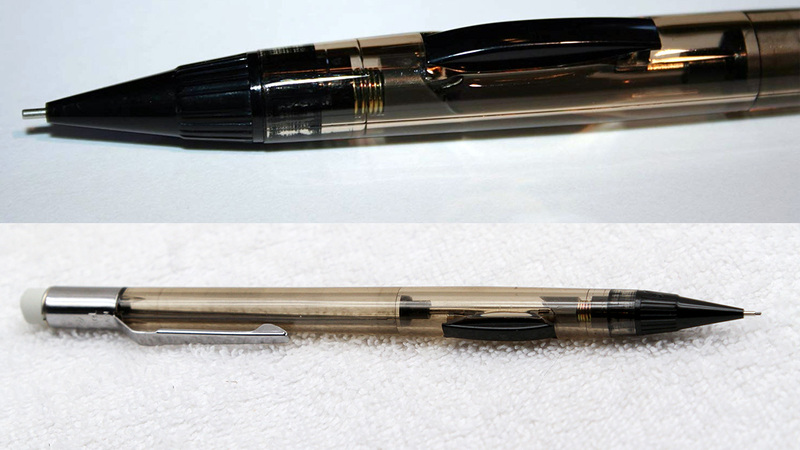 While the Pen Museum is intended to cover unusual and often discontinued writing instruments, there will be times when a recent production pen or pencil may be featured. This is such a case. Most mechanical pencils use a single click-action rear plunger to advance lead. Some others require a twisting motion. And a rare few use some kind of side mounted button that either slides forward or presses inward. It appears that Mitsubishi (Uni-Ball) originated the button clicker, and aptly named it “Pecker.” I’m not kidding. I guess because you kind of “peck” at the pencil with your index finger (but was actually “push”, sliding forward). This was sold in Japan and so it was likely that the marketing people neglected to look up related meanings to that word in other notable countries, like the USA. 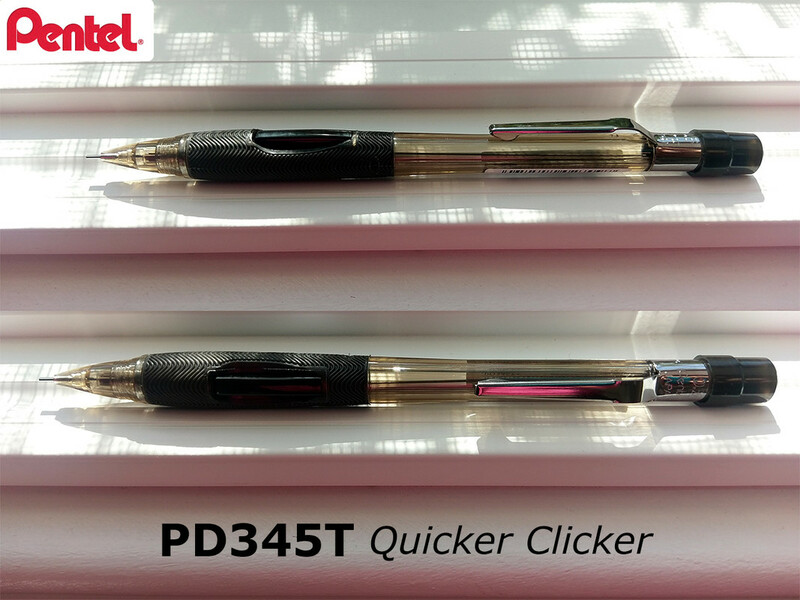 The first version of the Quicker Clicker appears to have come out sometime in the mid 1970’s, with a base model number PD345 (“5” means 0.5 mm). There is also PD347 and PD349 for 0.7 and 0.9 mm lead sizes respectively. Some had solid opaque plastic colors (black, red, green, blue, and white) and later translucent models would appear (denoted with “T” suffix) with various tints such as blue, violet, burgundy, and smoke. They had no grip assist of any kind (such as cut lines or rubber coating) and the nose cone was made of an opaque plastic on all models (usually black). How does the vintage and newer versions physically compare? Unfortunately I don’t have an original Quicker Clicker to disassemble, but I’m guessing that the internal mechanism is the same. I used to have one of these (solid blue) and used it all throughout high school (somehow didn’t lose it for many years, until my last move). The parts appear to be decent quality. 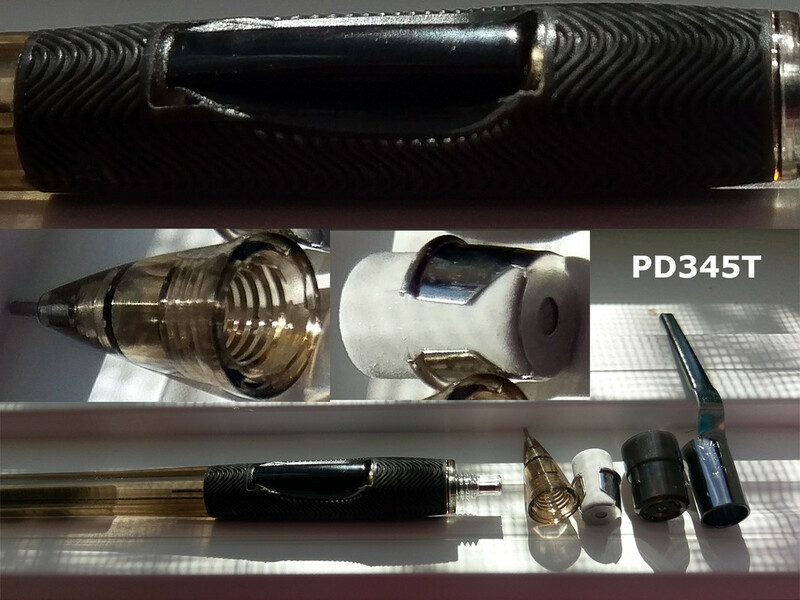 I disassembled this PD345TA and it still has the same thick steel clip with large collar to hug the plastic barrel, and taking a rather nice chunky tub of an eraser that seats inside a decent circular metal frame (there’s even a small hole in the bottom so you could dock a lead clearing tool inside it). There is still a plastic cap that goes over the eraser, and while it does friction fit to a fair degree, I wish it had a more prominent “click” to lock in place. I remember losing mine during high school, only a few weeks after getting it. The nose cone is now transparent and tinted a brownish smoke color. I like the fact that you can see into it, versus the old style opaque black plastic. The mechanism is mostly plastic, except that the chuck is brass and the 3.5mm pipe guide is stainless steel. The rubberized grip is a nice addition. It is ribbed with a wavy pattern. It appears to be made of a rubber that provides a good enough grip without being sticky and a lint magnet. However, there have been some reviews posted on-line (Amazon) declaring that the grip doesn’t last more than a few years before degrading. That was on the successor to the first model with a smooth surface grip design, so perhaps that issue was addressed with the newer PD345 having a wavy rubber grip? For my hand (L/XL) the grip is a welcomed swelling of the section that feels very comfortable and the grip provides excellent control. I can see the grip getting dirty and grimy over time, but it should be relatively easy to clean (an old toothbrush with some soapy water would do the trick). Other features: the barrel being a tinted transparent plastic means you can easily see the lead inventory inside, which is something lacking for many pencils. Also, Pentel was smart in that there’s a small lip inside the tube so lead doesn’t come sliding out so easily when the back eraser plug is removed. The side-click mechanism works nicely with the index finger button pumping out a modest amount of lead with each click and not making an attention getting click noise in the process. The overall experience is a lightweight pencil that is modest and yet full of precise control. 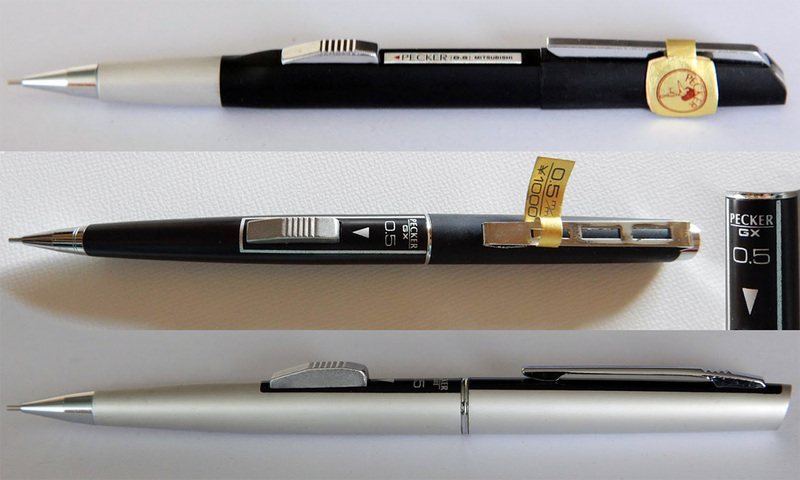 All in all, Pentel is still making a fine writing instrument here–well made and affordable for the price. The whole model line is referred to as “PD34x”, which consists of PD345, PD347, and PD349 (last digit is the lead size). From there, a letter suffix is used to denote the variations. There are presently several colors available — black, blue, burgundy, and violet. A: Black, B: Burgundy, C: Blue, V: Violet. The transparent version includes a “T”, and opaque has no letter. Note that “TA” is “transparent black” but equates to “smoke”. The original Quicker Clicker had several other colors that include green, red, blue, black, and white. This entry was posted on December 6, 2018 at 5:47 pm and is filed under Mechanical, Pencil. You can follow any responses to this entry through the RSS 2.0 feed. You can leave a response, or trackback from your own site.